Hello to all those out there who read my blog (i.e. Mom & Dad [maybe] and some photo friends). 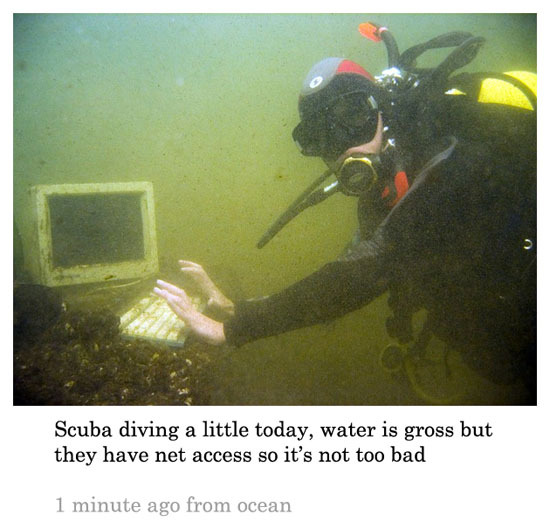 This post is a departure form the normal stuff on here, though I will assure you it is at least geeky. I'm in an online class where our work is kept track of through our blogs. So, like last semester with my NEW 305 posts, every now and then you'll see an IST 400 post. Feel free to ignore the posts, it won't hurt my feelings (though I can't guarantee the same if you ignore my "real" posts). Today is all about twitter, now, while I do use twitter, I'm not exactly the most active community member. I mostly use it to drive traffic here and to my flickr and vimeo pages, as well as to share interesting news items directly with my google reader account. Well today I actually participated in THREE trending topics, which you can check out below. I have said before that twitters trending topics always seem to attract the most illiterate and ridiculous twitter users, oversharers and spammers (check out the #itkillsme TT if you don't believe me). There are the execptions however, TTs in their infancy, and that are about breaking news issues (Haiti, Conan, iPad) tend to be somewhat interesting, although sometimes it seems they just kind of fan the fire without providing dialogue (see the "year old gives birth" TT for an example of this). Anyway, trending topics aren't for me, but they can be good for a laugh or a quick look into the public psyche every now and then. Next is analyzing the content of 5 out of 100 of the top twitter users via twitterholic. Hammer is a ridiculous man, whether he tries to be or not. His tweets are often back and forth conversations between himself and a German/Japanese radio DJ who goes by sascha348. Most of Hammer's tweets are random quotes, pieces of knowledge and (semi-obvious) observations, like the one above. Yes Hammer, technology exists and it has been doing some cool things. So from what I can ascertain Hammer has a radio show and communicates with both the listeners and the other DJ via twitter, and on top of that uses it like the stereotypical "Just ate an awesome sandwich" user. Oh, he does give some halfhearted attempts at social awareness though. Ok this is actually pretty cool. When I saw Whole Foods on the twitterholic page I was wondering how a grocery store got on there, even if they are a grocery store with a cult-yuppie following (full disclosure: I often shop there when I can afford it). Anyway, they use twitter to connect directly with customers to help fix problems and spread info. You can see by checking out the feed its not all PR though, they actually answer customer questions and listen to feedback, try to find out how to improve their services. Well done Whole Foods. I wouldn't be a journalist if I didn't bring up the NYTimes on twitter, though I must say their twitter feed kinda disappoints me. Its is pretty much just links out to stories on their site, which is useful I guess, but I have them in my RSS feed so its redundant for me (other people though, may prefer this to RSS). There isn't much else to say about them, they don't seem to interact with their followers, or even attempt crowdsourcing or polling of their users, however I can't completely confirm this suspicion because there is no way I'm going to pore over ever tweet they've sent in the past year. I was hoping for some creativity NYTimes, you let me down. I wouldn't be a jaded journalist (redundant?) if I didn't bring up The Onion. Once again, kinda disappointing when you check it out, just links back to their site. I was really hoping they'd be creative with their 140 character limit, though Onion headlines are already perfect attention grabbers for a service like twitter. I guess maybe I was expecting some tweets along the lines of those by @fakeapstylebook (who I recommend in Follow Friday up above). 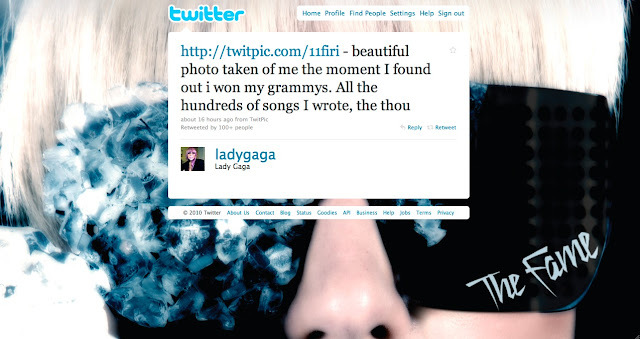 Lady Gaga is smart when it comes to twitter, she thanks fans, interacts with them, shares photos and "personal" thoughts. She clearly takes a page from Ashton's book. What I liked about her feed was that she realizes who her audience is and serves them well. She updates frequently and specifically, talking about being backstage, winning her awards, etc, and she mixes in links to donate to Haiti without coming off like the stereotypical celebrity jumping on the latest social cause bandwagon. She gets a kudos from me, which if you are not aware is the most prestigious recognition you can get on this here internet. 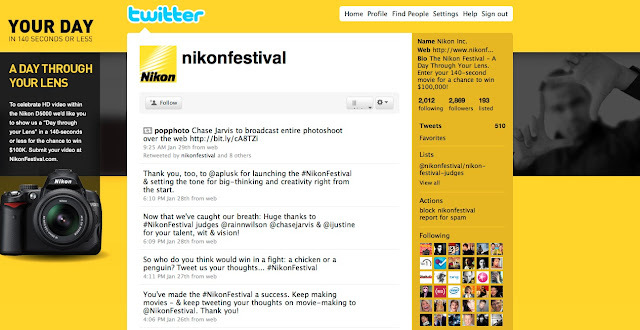 Lastly, I'll bring up @nikonfestival, which was promoted, run, and based entirely on the twitter concept. Thought he festival ended recently, Nikon is still promoting themselves through this twitter account. The concept of the festival was to make a video that captured you day in 140 seconds or less. Pretty neat idea and a great way to have an open-ended theme that has a rigidly defined structure but endless interpretations. Nikon really did a solid job on this ad campaign, and managed to promote it almost solely through twitter.